Xiaomi has quickly become a name to reckon with in the technology industry and for good reason. It understands customer requirements and delivers products that are best suited to meet those requirements at a very reasonable price which is the key reason for their growing success and popularity. 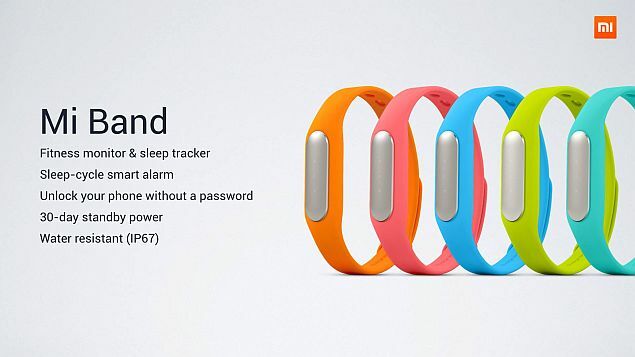 Xiaomi has already made a mark with its handsets and is now taking the technology world by storm by introducing the Mi Band which has received good reviews and reception. The band is simple with the design being minimal without anything fancy added to it. The band has a tracking schedule with a clear matte finish and comes in either a black or colourful bands. The metal is made of 100% aluminium alloy giving it a sleek finish. It has four indicator lights and weighs a mere 5 grams. The body of the band is made of polycarbonate which is also water and dust resistant. The band is powered by a 41mAh which can give a battery backup for almost a week. The band is compatible with Bluetooth 4.0, Mi 3, Redmi Note 4G as well as all other android devices having Android 4.4 and above. The iPhone models need to be iOS 7 and above. It doesn’t restrict movement of the wrist and is extremely wearable and functional. The band acts as a fitness monitor and helps you track your various activity levels. From the time you wake up and the steps you take be it going to the office, running around for chores or going for a morning run, the band records your activity and lets you know if you’ve achieved your daily targets. You’re literally walking towards a healthier life style with this band. The band not only monitors your sleep but also your sleep pattern letting you know how many hours of deep sleep have you had and how many hours of restlessness you’ve faced. This information can be handy in better designing a sleep schedule by trying to give the body the rest it needs to recuperate. The band also performs certain functions which are not just health and fitness related. It has a highly effective alarm which can nudge you 30 minutes before your actual alarm preparing your body for it. This allows you to wake up with comfort rather than suddenly being jostled out of sleep which can be quite annoying. It also sends notifications regarding calls, messages and notifications and you can even unlock your phone using the band. Through the band you can set a daily goal and target about burning calories and setting fitness goals that will help you maintain the lifestyle you want. The band comes in a variety of colors for you to pick from and express your individuality. The band is great for tracking daily fitness activities giving you a good push by informing you how fit you keep. However the band is known to overestimate steps and sleep activity as well. Besides that, it’s a great fitness tracker for its budget that won’t be a disappointment to buy!